Betsy DeVos–platinum card member of the 1% and leading corporate education reformer–was voted in today by the Senate as the next U.S. Secretary of Education. With the vote deadlocked at 50-50, Vice President Mike Pence, cast his vote for Ms. DeVos and announced that President Trump’s nominee for education secretary had been confirmed. As I explain in this interview with journalist Sarah Jaffe, Secretary DeVos has no experience with public schools besides trying to get rid of them with privatization schemes. But while DeVos has been confirmed, so too has the resistance. Parents, students, educators, and their unions are organizing grassroots movements that have the potential to defend and transform public education. Public schools have been a bipartisan battleground for years now, with teachers unions taking attacks from elected officials at all levels as part of a broader movement to “improve” education by handing control over to private companies. Donald Trump’s nominee to run the education department, Betsy DeVos, is a stalwart of this privatization drive, never having met a public school she liked (and barely, as many have pointed out, having met a public school at all, since she neither taught in any nor attended them nor sent her own children to them). But teachers around the country are organizing against privatization, and gaining support from parents and students. 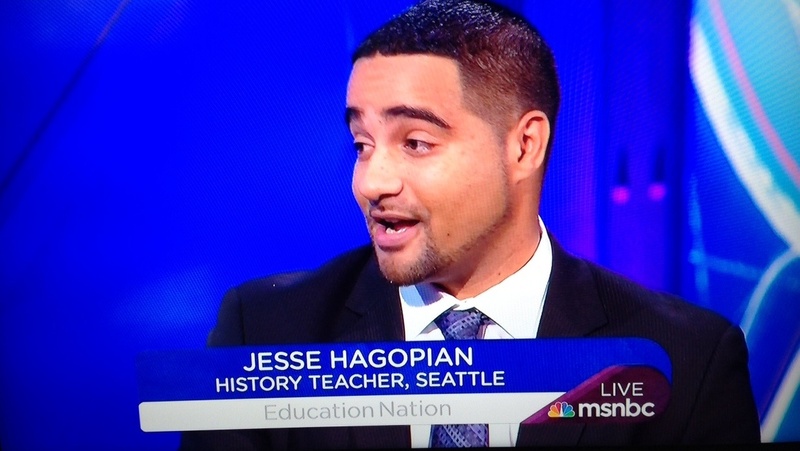 We talk to one of those teachers, Jesse Hagopian. Earlier this year, our football team (the entire team) took a knee during the national anthem in protest of police abuse. Then, it spread to the girls’ volleyball team and the girls’ soccer team and the cheerleaders, even the marching band. Everyone was taking a knee to raise awareness. Then, after Trump’s election, there were some five thousand students across the district, or more, that walked out, including large numbers at the school. It is exciting to see a new rebellion amongst young people today. I have been hearing from teachers who are having a hard time figuring out how to talk to their students about Trump’s election. Can you talk a little bit about what it is like being a teacher in this moment, talking to your students about what is going on? The first example I want to use is from my son’s school. The day after the election a young Muslim girl came in and she hadn’t yet heard that Trump won the election, so she found out there at school. When she found out, she fell to the ground and was pounding her fists into the ground and crying. She was just terrified about what could happen to her and her family — whether they would be split apart — [and] fears of violence. I am so proud of what my son’s teacher did. She decided right then and there to gather all of the classes at the grade level and bring them together, and all the families who were there for drop-off, and hold a discussion, allow kids to discuss their fears and their thoughts and let them know that this is going to be a safe place for them. Then, we also have to do it in the curriculum. It is so critical that our curriculum is talking back to the textbooks, which too often just glorify American history without engaging kids in critical thinking about the real challenges and forms of structural oppression that have been perpetuated throughout US history. We have to allow them to dig into the curriculum and into the history to figure out how we arrived at a moment like this. It’s really crucial to helping support them right now. The Seattle Education Association had a strike fairly recently and I believe one of the issues at stake there was racial justice, in particular, in the schools. Absolutely. Last year we went on strike for five days. One of the main demands was about having racial equity teams in every school. The district opposed us and didn’t want to add any racial equity teams. We wanted them in every school building. By the end of the strike, we had negotiated 30 racial equity teams across the district, which was really critical to advancing social justice education in Seattle for a number of reasons. One, it brought us together with the community. Some of the key leaders in the Black Lives Matter movement signed onto a letter supporting our strike because of our desire to fight for racial justice in our schools. Then, this past fall, this October, we were able to build on that victory. We actually built a monumental action. It was called Black Lives Matter at School Day. It started with a few teachers, but it mushroomed into an action [where] some two thousand out of five thousand teachers in Seattle wore Black Lives Matter shirts to school. Many hundreds of teachers taught lessons about structural racism and the Black Lives Matter movement that day. The Seattle strike was one of several teachers’ strikes in recent years. Can you talk about what has been going on among teachers’ unions nationally and the challenge to the attacks that public schools have been facing? The assault has been brutal on teachers’ unions across the country. It has been bipartisan. It happened with an increased strength against our unions under George W. Bush with the No Child Left Behind act. It only accelerated under Obama and his Race to the Top scheme that would further link teacher evaluations and pay to test scores, destabilizing the work force. I think that this attack is so strong because the richest 1 percent in this country know that teachers unions are the biggest unions left in America. They are one of the most concentrated sources of organized labor. They have the ability to really transform the labor movement and our communities, to make ties with parents, students and teachers, and because of that source of strength they have also become a target. When Betsy DeVos was nominated I was struck by the fact that she is a figure that is very closely associated with school vouchers, which in recent years had kind of fallen by the wayside in favor of this really big bipartisan push for charter schools. Can you talk a little bit about those two things and these waves of privatization? I think privatization is the central aim of the corporate education reformers. The Democrats, over the last eight years under Obama, had worked very hard to give charter schools a liberal gloss and make them seem as if they were part of a civil rights movement to rescue inner city kids, Black and Brown children, from a failing school system, when in reality these charter schools often underperformed the public schools. They function to siphon off money from the public school system to privately-run schools. They often have some of the most draconian discipline policies. We have seen that Black and Brown students are suspended at much higher rates in charter schools, from recent studies. These schools were just the opposite of what the Democrats had promised, but they were able to cobble together a coalition for a while of people across the political spectrum who were advocating for these schools as an alternative to what they called “failing public schools.” I think that action really laid the groundwork for what we are seeing now, with the revivals of vouchers, which are just another strategy for privatizing public education, giving kids a limited amount of funds to use to go to any school they want rather than actually investing in the public schools and making every public school a quality one with the resources it needs to succeed. We live in a country that can find trillions of dollars to bomb people all across the world and can find trillions of dollars to bail out the banks that sabotaged the global economy, but when it comes to our kids’ education, they want to try to do it on the cheap. They want to actually try to make money off of it rather than fully invest in the schools that we would need to help our kids succeed. When Trump announced Betsy DeVos, I said, “She has no idea what is coming her way,” because the movement around public education has gotten so big and so strong in the last couple of years. I wonder if you can talk about the way that students and parents and teachers are really coming together to fight for community public schools. Absolutely. That is really what we need. The advantage that people like Trump and the rest of the 1 percent have is their immense wealth. The advantage we have is our numbers. Those numbers are really visible around education, because it draws in so many diverse groups together in one place. It brings together labor with parents from all different backgrounds, and students. It has been a source of power for community organizing and social justice initiatives around the country. Last week, the teachers in Philadelphia launched Black Lives Matter at School Week. The whole week, they had a different theme every day, within the Black Lives Matter movement, to highlight the different intersectional identities within the Black community and teach lessons and hold dialogues around those actions. That has already been a powerful example of bringing together families and labor in a common struggle. Do you have specific tips from the work you have been doing in Seattle for educators in other places who want to start talking to people in their community, their students and their students’ parents, particularly around issues of racism, but in general around the issues that their communities are facing? One is, for fellow educators, it is really critical to form a caucus inside the union to gather together like-minded social justice advocates and begin to present your ideas to the broader union, to help make your union strong enough to fight back against the privatization attacks and to help raise social issues like the Black Lives Matter movement. Oftentimes, beginning with a study group is a good way to go, getting a book to read. In Chicago, the social justice caucus that won the election and took over the union began by reading Naomi Klein’s book The Shock Doctrine. It was just a small study group and now they have quite a bit of influence in that city. Right here, we recently held a study group on Keeanga-Yamahtta Taylor’s book From #Black Lives Matter to Black Liberation. Finding a book that can bring people together to discuss their ideas and then talk about how we want to implement them in the union is critical. Then, I think picking a couple of key issues that you can organize around that will bring in parents, students and teachers. Here in Seattle, one of the main issues that we are rallying around right now is the fight for Ethnic Studies. I would add Gender Studies, as well. I think in this time where our president disparages Black Lives Matter, where our president is an open sexist and a proud sexual assaulter, I think we need to teach our kids the truth about the contributions to this country of people of color, and of women, and the struggles that they have been through. We are launching an initiative with the NAACP here in Seattle to demand that every school include Ethnic Studies. A recent study out of Stanford showed huge benefits academically, for Ethnic Studies programs, in raising graduation rates. I really think that is something that needs to take off across the country. Betsy DeVos has not been confirmed yet. Even some of the Democrats within Congress who have rubber-stamped most of Trump’s other nominees are saying that they are going to fight on hers. People who are following that, what can they do? We need to fight as vigorously as possible against her confirmation because she has absolutely no idea what she is doing with public education. She never went to public schools, her kids didn’t go to public schools, her only association with the schools is her attempt to privatize them with her foundation. During her confirmation hearing they asked her questions about her family foundation because her family foundation has given millions to the Republican Party, but even more despicably, has funded things like gay conversion therapy, which is a pseudo-science that is an absolute atrocity in the way it psychologically abuses LGBTQ youth. She has no business being anywhere near a public institution that is meant to nurture all of the kids in the United States. Lastly, how can people keep up with you? My website is IAmAnEducator.com. They can follow the work I do there or on social media. Most importantly, I think getting a subscription to Rethinking Schools and bringing social justice lessons into your classroom is the best way to stay connected to the movement. “Turning the Streets Into Our Classroom”: Vote for May Day Strike! Thank you, Jesse. Just tell me where the first resist action against Betsy is-I will be there!!! SO MANY LONG YEARS bent to the “…movement to ‘improve’ education by handing control over to private companies…” where the word “improve” has been used only as pretty camouflage for an every year more deregulated profiteering.